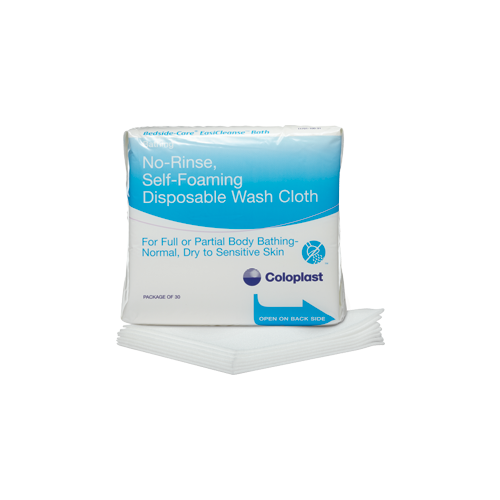 Bedside-Care EasiCleanse, manufactured by Coloplast, are no rinse body wash bathing wipes, especially created for bathing, shampooing, and incontinence cleansing. Made with patient satisfaction in mind, EasiCleanse self-foaming bath wipes offers the sensation of a luxurious, sudsy bath without the need for a basin. These bathing wipes are non-irritating and non-sensitizing, so it is perfect for the most sensitive skin types. Equally important to being non-irritating, Coloplast wanted to develop disposable washcloths that are free of preservatives, dyes, alcohol, and latex, which is how these Bathing Wipes came to fruition. In addition to being preservative, dye, alcohol, and latex-free, these no rinse bathing wipes are pH-balanced, too. The wipes are CHG (chlorhexidine gluconate) compatible, so they will not interfere with CHG based skin antiseptics. These bathing wipes are even suitable for neonatal use. Order now and feel pampered and clean with the best disposable washcloths today! If you're interested in this product line, but do not like the idea of disposable washcloth, make sure to check out our selection of other cleansing agents, such as the no rinse body wash foam and no rinse body wash spray, here. For the patient satisfaction of a sudsy bath without requiring a basin. Preservative, dye, alcohol, and latex-free. Product Number: 7055 (unscented) and 7056 (scented). Area of Wipe: 7.9 x 7.9 inches. Application: To cleanse a body without the need to rinsing. These self-lathering, disposable washcloths are amazing. I am a caregiver to my elderly mother and rely on these cloths to provide a wonderful cleansing bath for her when it is not possible to bathe in the tub or shower due to medical devices and her condition at the time. These do not require rinsing which makes it all the more amazing. If ever a cleanup job is needed ... these are fantastic to have on hand. These also come in handy when a spot bath is required (diaper changes, etc). I highly recommend them and don't know what I'd do without them in my home healthcare toolbox! I was in the hospital last summer for seven weeks. I dreaded the thoughts of a bed bath from experiences years ,earlier, but the nurses aides brought those cleansing cloths. They were a delightful experience. I use them now at home. The cloth used in this product is perfect for tender, thin skin. They clean very well without pain and irritation. This is the only cloth I can use on my grandmothers skin with zero pain while bathing.